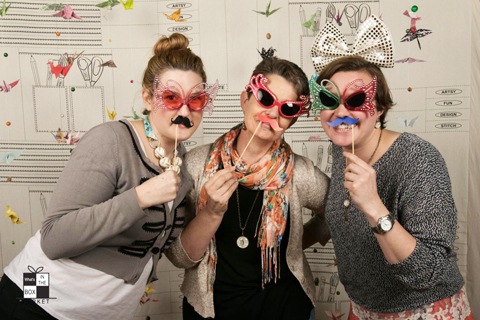 My name is Leanne Averill and since the time I was a little girl I have been a ‘maker’. 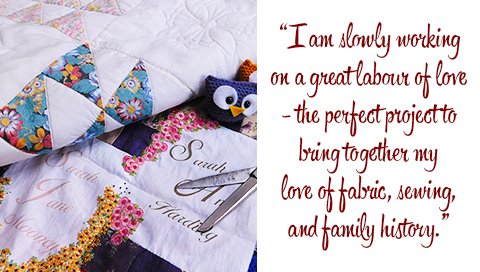 I particularly love working with fabric and I guess, in the old days, it would have been said that I was proficient in the gentle arts – knitting, crochet, embroidery, sewing. I was taught by my mother and her mother. 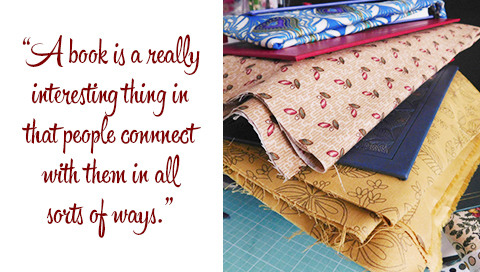 I cannot think of a time when I have not had a needle and thread, knitting needles, wool or fabric in my hands. These wonderful women passed onto me skills that have given me a lifetime of pleasure and provided an excuse for me to sit quietly and make something. This has kept me sane over many, many years. 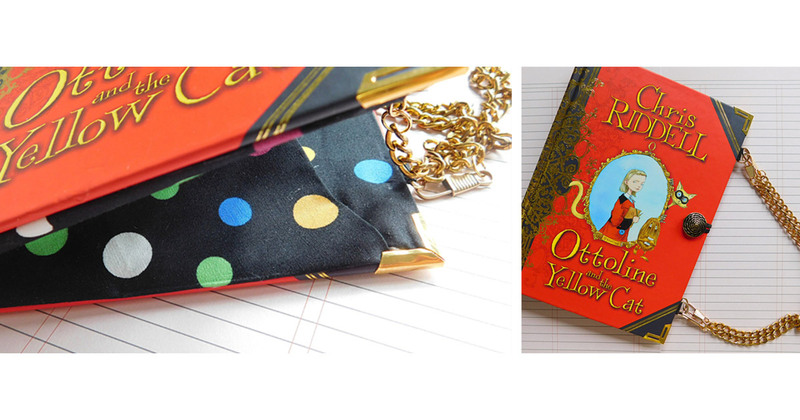 I create handbags and notebooks out of second-hand books that I generally source from op shops. They are absolutely one-of-a-kind items. 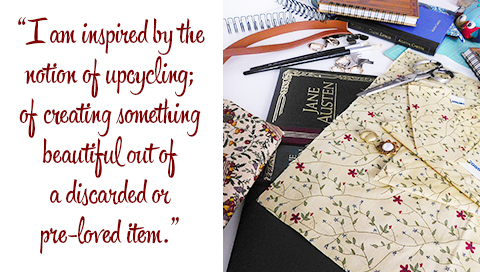 I guess I am inspired by the notion of upcycling; of creating something beautiful out of a discarded or pre-loved item. And a book is a really interesting thing in that people connect with them in all sorts of ways. It could be a favourite, or something from their childhood, or something that has been significant at a particular time. And I see it all the time in the choices people make in the Novel Bags they choose to buy. I also love the idea that when you have one of my bags or notebooks, you have something that embodies more than one story. I was knitting and crocheting by the time I was about 10 and I still use a blanket I made out of crocheted granny squares when I was about 15. For many years I have been a hand quilt maker but sadly a bit of arthritis has made this increasingly difficult for me to do, so production has slowed down somewhat. I am slowly working on a great labour of love – a quilt with the printed names and images (when available) of all my female ancestors –mother, grandmothers, great grandmothers and great, great grandmothers. Each of them surrounded by hand embroidered flowers. Another great love of mine has been the discovery of my family heritage and particularly the stories of the women who have gone before me; extraordinary people. This seemed like the perfect project to bring together my love of fabric, sewing, and family history. My grandmother has been gone for more than 25 years but I still remember her surrounded by fabric, sitting at her sewing machine in the afternoon sun. I inherited her fabric scissors and they are still the only scissors I use to cut fabric. Anyone who thinks they can use them for any other purpose, better look out! I live in an inner suburb of Melbourne in a fabulous factory conversion apartment. My husband and I each have our own room that is ours to do as we please. His is called an office and is neat and tidy. Mine is called a studio and generally isn’t. 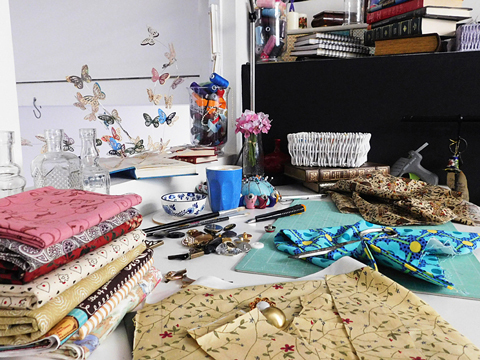 I am surrounded by books and fabric and have a wonderful space where I spend time making stuff… sadly, it is not enough time! I am also a career librarian and now manager of a very large public library. I am a lover of books and literature, and how the written word has the power to transform people’s lives. 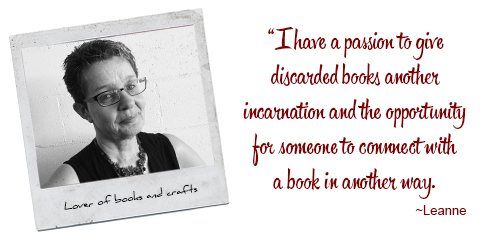 But a harsh reality of life is that there is a finite number of books that people (and libraries) can have in their collections and many, many books are discarded. And in the digital world, this is absolutely a fact. 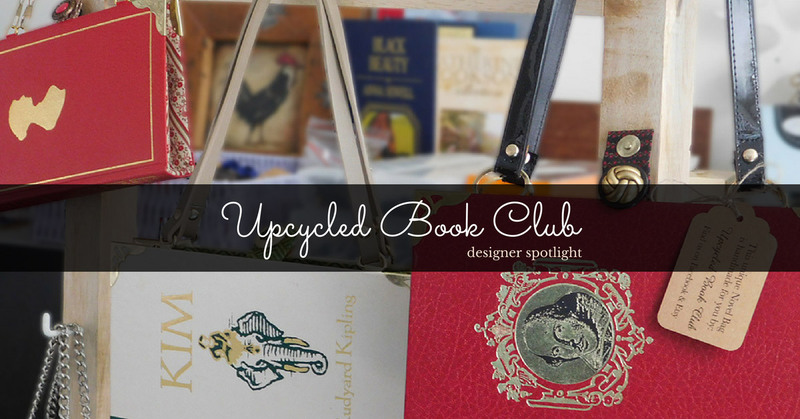 Upcycled Book Club began after I made something for a good friend’s 40th birthday. I met Joanne at work, she an English teacher and I the librarian, and instantly clicked. I wanted a one-of-a-kind gift for her birthday and preferably something I had made. One day at work a book about upcycled art crossed my desk. 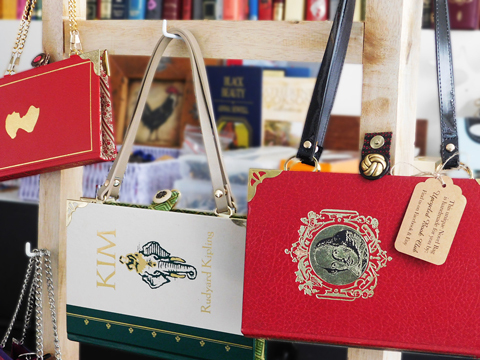 One of the item features was this amazing handbag made out of an old book…that was all I needed. I knew exactly what I wanted to give Joanne for her birthday. I had to work out how to do it and in pretty short time. There were some pretty average efforts that ended in the bin but I finally had what I wanted. Not only did I have a unique gift for my friend but I had a passion to give discarded books another incarnation and create the opportunity for someone to connect with a book in another way. The fact that it also involved fabric was just perfect! 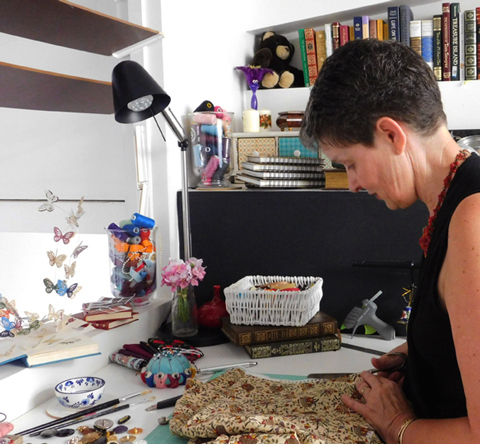 My two amazing daughters-in-law, Rebecca and Eleanor, have joined me on this journey and have made earrings and pendants, folded flowers and book art from the pages of the books and at one stage, hand-poured soy candles in second-hand teacups. Busy lives make it pretty tricky for them to spend much time making and at this stage, only Eleanor is a part of Upcycled Book Club. When we do local markets, she sells her individually crafted jewellery, each made from the discarded pages of the books that have been upcycled into bags. Being able to sell on Made It is so enabling. I’m time poor and taking a whole day out of a weekend to do a market is a big task. Having an online store is just amazing. I love that it is Australian and is targeting an Australian audience. I found so many people making amazing things and Made It is such a great way to hook into the maker community and reach out to craft lovers alike. 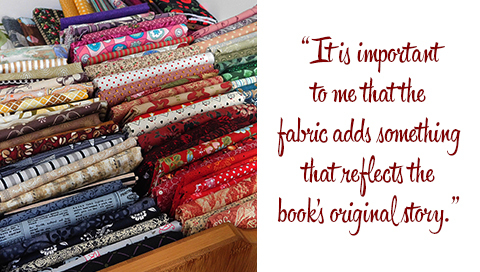 One of my most favourite parts of the creation process is matching the fabric and the book. It is important to me that the fabric adds something, to the final product, not only aesthetically, but that reflects something of its original story – so an exotic golden fabric is brilliant for Tales of the Arabian Nights or teapots and cups for a Jane Austen novel. I also love the hunt for second hand books to use to make both my Novel Bags and my Novel Notebooks. Not all books are appropriate in format or title or condition. I am a regular visitor to all the op shops around me and thankfully there are lots and I am always looking for the perfect book. I love giving and receiving gifts that are handmade and I reckon this is a shared experience for many people. There is something wonderful in giving and receiving an item that has been carefully crafted and is the result of a creative process. I often shop at markets and am always on the lookout for handmade things. For Christmas last year, I gave all my staff a couple of small ceramic bowls, handmade by a local artisan. They were such a lovely gift to give and were so well received and I was so happy to be directly supporting their creator. I am never happier than when I am making. The tactical experience is very important to me and is the perfect foil for a busy week full of people and meetings and managing a large public facility. I am at peace when I am in my studio and using my hands. My mind seems to settle into the rhythm of the work and my body is stilled and focused on the task. Sadly, at this stage, more time is spent in meetings than in making, but I am working on that!